Most of our prints for this blog are made on a MakerBot Replicator 2, since that's what we usually have at the house. But the other day one of the Afinia H-Series printers from the JMU 3-SPACE Classroom made a guest visit, on its way to the Expanding Your Horizons Conference, where Rebecca Field gave a wonderful 3D-printing demonstration and math talk to a large group of middle-school girls. 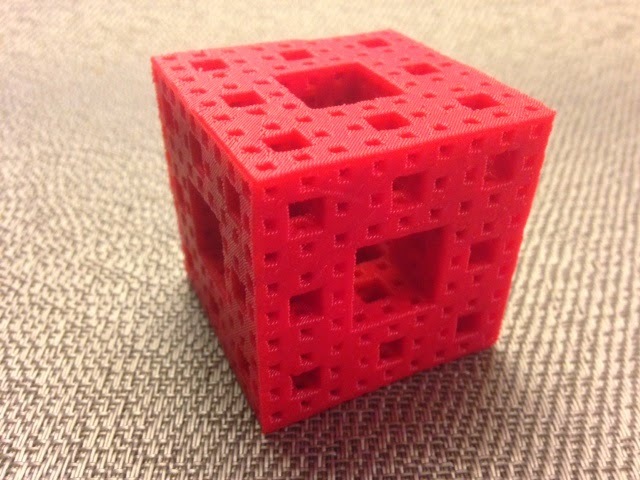 While the Afinia was here, Rebecca printed a demo Menger cube using owens' Customizable Menger Sponge model from Thingiverse. It worked wonderfully! Settings: Afinia 3D .3mm default fast, with a raft and with custom stand included in the model but no supports.